Conjuring the mighty spirit of Astaroth, protector and bringer of gold in the magick of the Middle Ages! The Goetia was an arcane text, compiled by magicians for magicians, kept out of sight from common folk. These magicians were always, without exception, wealthy and powerful men. The problem for modern occultists is that the rituals of this text were so complicated and obscure that they were all but impossible to perform. Most modern attempts to make these rituals have been in vain. Until now! Life-long occult researcher Marcel Dubois has at last penetrated its veil and come up with a very simple and accessible way of working this magick. For those seeking a magickal means of improving their income this is good news indeed! 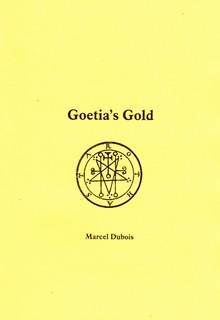 Mr Dubois calls this ‘Goetia’'s Gold’ on account of the 28th magickal angel it describes – Astaroth, ‘bringer of gold’! – one of the most revered spirits in medieval magick ritual! He supplies the simple and clear procedure for conjuring Astaroth to be at one’'s beck and call! And do so in complete safety! ‘These conjurations make your magick happen, the mighty spirit springing into immediate action to set the wheels of fortune turning in your favour!’ declares the author! Conjuration One: for bringing money! ‘When I ﬁrst tried this I was quickly awarded a contract to write a series of articles in a scientiﬁc journal with a worldwide circulation. This guaranteed my income for six months, a true boost to a freelance writer! Conjuration Three: for a charmed life. Whilst Astaroth ‘specializes’ in ﬁnancial matters, he can be conjured for good luck in general. ‘Once you are conjuring this spirit on a regular basis he will continuously fulﬁl your needs! My sister conjured him to assist her struggling son who had been refused a mortgage from every lender he went to. Very quickly events conspired in his favour and he received a loan from an unexpected source. My sister then asked Astaroth to save his failing marriage. This not only worked but her son and his wife became like honeymooners all over again! Astaroth rewards not only ﬁnancially, his ‘gold’ encompasses anything that will make your life ‘richer’ – true love, better health, etc.